Phase 2 of jury selection in the federal death penalty trial of Boston Marathon bombing suspect Dzhokhar Tsarnaev is set to begin this week. The judge, Tsarnaev's attorneys and prosecutors will begin questioning prospective jurors in the case Thursday. Last week, more than 1,350 people filled out 28-page juror questionnaires. Those will be used to weed out people with obvious conflicts. During individual questioning, prospective jurors are expected to be asked about their backgrounds, their feelings about the death penalty and whether they have already formed an opinion about Tsarnaev. 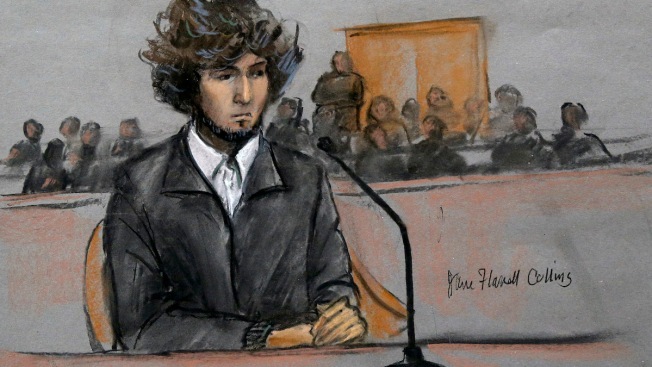 After three days, six sessions and roughly 1,350 prospective jurors, Boston marathon bombing suspect Dzhokhar Tsarnaev has likely been introduced to the 18 men and women who will make up the jury of 12 plus six alternates who will decide his fate. The 21-year-old Tsarnaev is accused of carrying out twin bombings near the finish line of the 2013 marathon. Three people were killed and more than 260 were injured. He is also accused in the fatal shooting of an MIT police officer.